A day after the opening ceremony, where players were given presents and some good advice from Tony Rich, the tournament director, the players were ready for the first round of the 2017 U.S. Junior Championships! 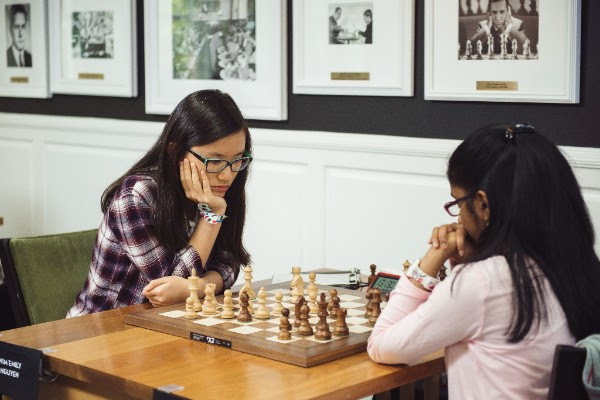 What a first round it was; Akshita Eswaran essayed the Benoni against defending champion Emily Nguyen, and Thalia Cervantes went all-out against Agata Bykovtsev, with the ultra-sharp Four Pawn’s Attack! Emily Nguyen reacted well against Akshita Eswaran’s Benoni and gained the upper hand. Nguyen played 14. Qb3! targeting the weak Black Queenside, and after the inaccurate move 15…g5, she uncorked the typical Benoni break with 16.e5! and 17.d6! The rest was simple, and Emily Nguyen won her first round game! The game between Thalia Cervantes and Agata Bykovtsev was one of the most intriguing games of round one. Thalia Cervantes, who came to the Junior Championship straight from the Pan American Championships, went all out against Bykovtsev. Bykovtsev, as she told Cristian Chirila after the game, thought that 14…b5!? was part of her preparation. In any case, it turned out to be slightly dubious, as Thalia duly accepted the pawn offer and produced the fantastic rook lift 20. Ra3! and 21. Rg3! gaining a sizable advantage! She was well on her way to win, when she captured the wrong piece. 32. Bd4! would have won, but she played 32.Bc5+ allowing Bykovtsev back into the game, and after another mistake by Cervantes, Bykovtsev took over! 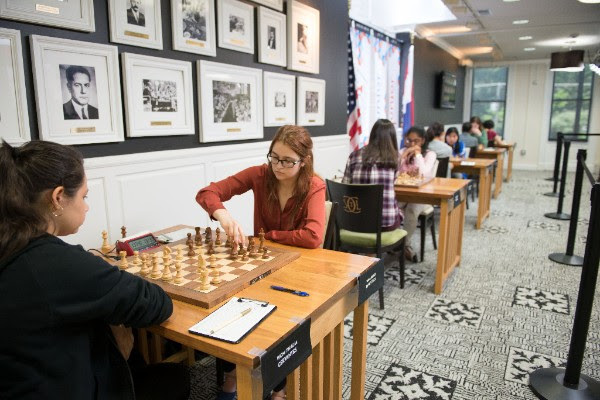 It was a dramatic game, were Thalia Cervantes showed some powerful play in the middlegame, and Agata Bykovtsev, showed great fighting skills, which helped her bring the point home. ”I expect blood!” exclaimed Tatev Abrahamyan in the live commentary with fellow commentator Alejandro Ramirez, right before the start of the round. Right she was, as the player’s from both section came with the same intentions: to win at all costs! 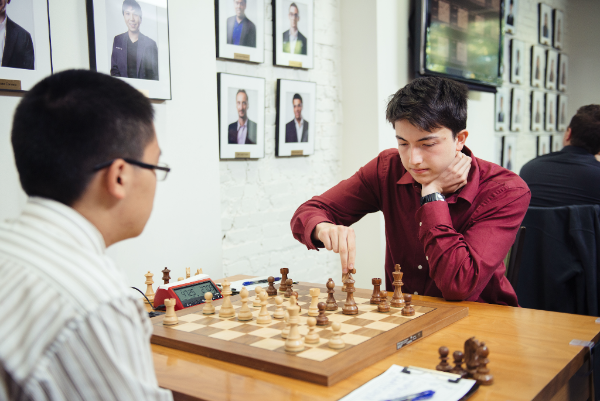 Ruifeng Li, the heavy rating favorite of the Open section, played his trademark move 1.b3!? against Mika Brattain. Brattain, however, wasn’t impressed by Larsen’s famous move and built up a solid position against Li. After few hours of play, Li managed to gain some space on the Queenside, but that was compensated by Bratain’s counterplay on the Kingside. Li had a slightly better position, but after Mika Brattain’s 24…Nh8! it was increasingly more difficult to make progress. Ruifeng Li, conscious of his advantage refused the repetition of moves, but ran into a fantastic sacrifice 27…Nf4! by Brattain, and the tables turned! 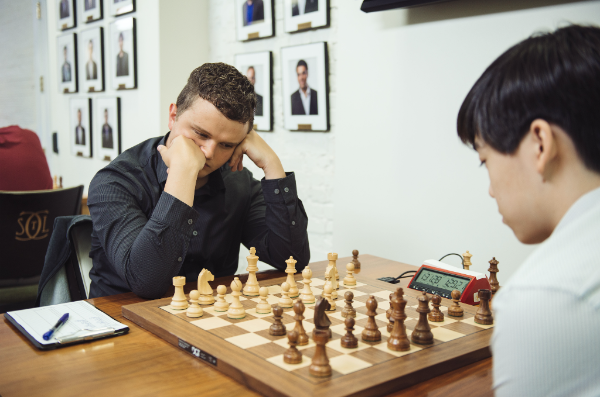 Brattain was calling the shots afterwards, but after missing several wins, the ever-resourceful Ruifeng Li managed to escape; with a perpetual check! The most contested matchups based on ratings were between Troff - Tang and Brown - Checa. Brown played an interesting sideline in the Slav against Checa, but even though both players avoided repetition multiple times, it still petered out to be a draw. Troff against Tang was a different affair. Troff came with a very aggressive line, which was known from the famous game played by Carlsen and Aronian. Tang tried to surprise Troff with the freeing move 9…g5! ?, but Kayden Troff was irresistible, and won a model game. 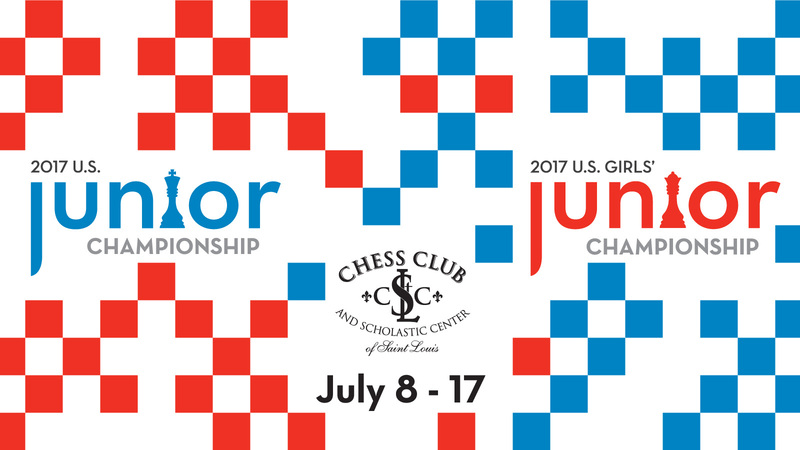 The hometown favorite Akshat Chandra, and the freshly-minted grandmaster Awonder Liang won their games fairly comfortably. In the Open Section, Liang, Chandra and Troff are in the lead, while in the Girls’ Section; Emily Nguyen and Agata Bykovtsev are sharing first place with one point each.